German manned rocketplane. Study 1939. On 6 July 1939 Wernher von Braun proposed to the German Reich Air Ministry a "fighter with rocket drive". Status: Study 1939. Gross mass: 5,000 kg (11,000 lb). Height: 8.50 m (27.80 ft). Span: 9.10 m (29.80 ft). The vertical take-off interceptor would use a 10,000 kgf nitric acid/Visol liquid rocket engine to provide an initial acceleration of 2 G's to launch the rocketplane toward attacking bombers. Launches from special bases or from trucks were possible. In 53 seconds the fighter would reach 8 km altitude and then maneuver toward the aircraft to be intercepted. A lower thrust secondary rocket engine of 770 kgf would allow a cruise speed of 700 kph. The aircraft was equipped with a gyro autopilot and moving map display to allow night missions. Launch weight was 5,000 kg; wingspan 9.1 m; length 8.5 m. Armament consisted of four machine guns. Evaluation by industry experts indicated that vertical takeoff did not seem to provide any tactical advantage and that the cruise duration using rocket power would be unacceptably limited. 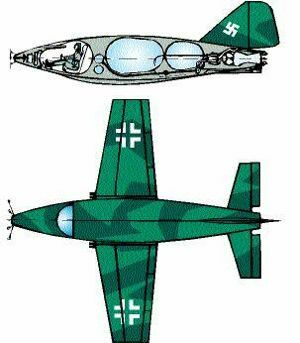 The design was developed further by Fieseler as the Fi-166, which retained the rocket takeoff but used a turbojet for a longer cruising flight. 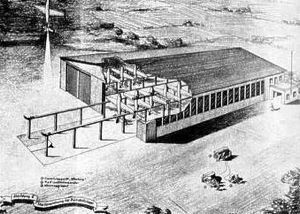 The Ministry finally rejected the vertical-takeoff rocket interceptor concept at the end of 1941. The concept was revived at the end of the war as the Bachem Natter. Family: European Rocketplanes, Rocketplane, Suborbital. People: von Braun. Country: Germany. Agency: Luftwaffe.